February | 2016 | Nicholas Hoffman & Co. Ever Seen a Million Dollar Brick? Low and even negative interest rates are causing pain for people around the world. I talk to investors daily who express frustration at earning a few cents each month for cash balances on their checking accounts. I have a “premium preferred interest checking” account that is paying 0.01%; so a $10,000 balance earns me 10 cents in a year! Maybe we should stop complaining. Banks in some certain countries are beginning to charge their customers to keep cash in their checking accounts. I wonder what I would do if that ever happens here. One story this week demonstrates the actions some people will take when faced with negative rates. Recently the Swiss banking authorities lowered their overnight rate from negative 0.35% to negative 0.50%. In other words, a million Swiss francs deposited in a Swiss bank account will now cost the depositor $5,000 a year. As a result, some depositors are saying, “Enough with the safety of the bank. Let me just keep the money in cold, hard cash”. It was reported this week that the demand for the thousand Swiss franc notes is so great that banks are running out. Apparently bundles of cash in this denomination are being held in the form of “bricks”. You might know that the use of the expression “brick of cash” is popular in rap music, but it is also now being used in the global banking community. Let’s look at what a “brick” means. A hundred notes of any currency are referred to as a “strap”, and ten straps are commonly known as a brick. In other words, a brick is a thousand notes. Given this stack of bills is about the size of a building brick, the source of the term becomes obvious. So a brick of one-dollar bills is equal to $1,000, and a brick of $100 bills is $100,000. For those interested in transporting large sums of money (none of whom read this column), a standard briefcase will hold about seven bricks of cash, which in total weigh about 15 pounds. So back to Switzerland – where some investors are opting to take cash out of their negative interest paying accounts, and bricks of money are the device of choice. The Swiss have a thousand franc notes, so an investor can very easily walk out of a bank with a brick of one million Swiss francs. Moreover, as noted above, a standard briefcase can discretely carry seven bricks. With the current exchange rate against the dollar close to parity, that means they can easily transport about $7,000,000! Just as the million franc brick gains appeal, we hear that the US Fed and Treasury Department are considering getting rid of the $100 bill. Could this really be the end of Ben Franklins – what an outrage! Part of the proposed rationale for eliminating large bills is that they are the denomination of choice for illegal activities. I understand the argument, but if negative interest rates hit the US, some law-abiding investors may well start thinking about the benefits of holding their cash in bricks. 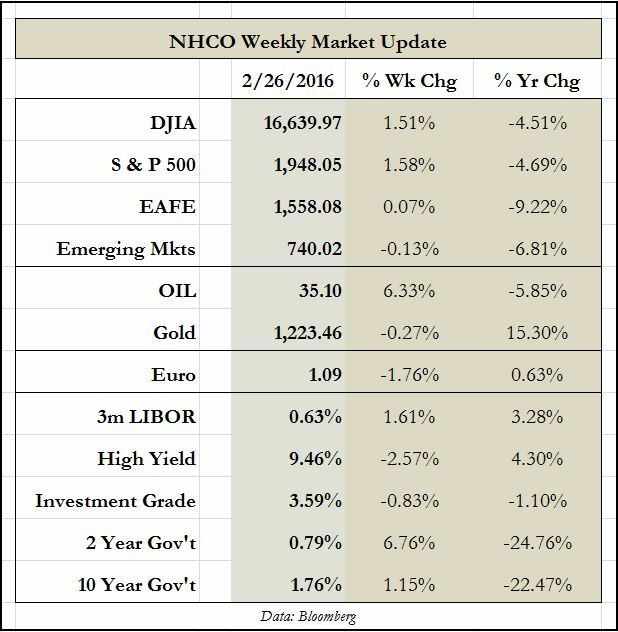 This entry was posted in The Weekly and tagged Bricks, Negative Interest Rates, Swiss Francs, Treasury Department on February 29, 2016 by nhoffmanandco.